Great post sal. Loving the picture of ‘Ben. I’m sure he’s smiling about that smugly somewhere! 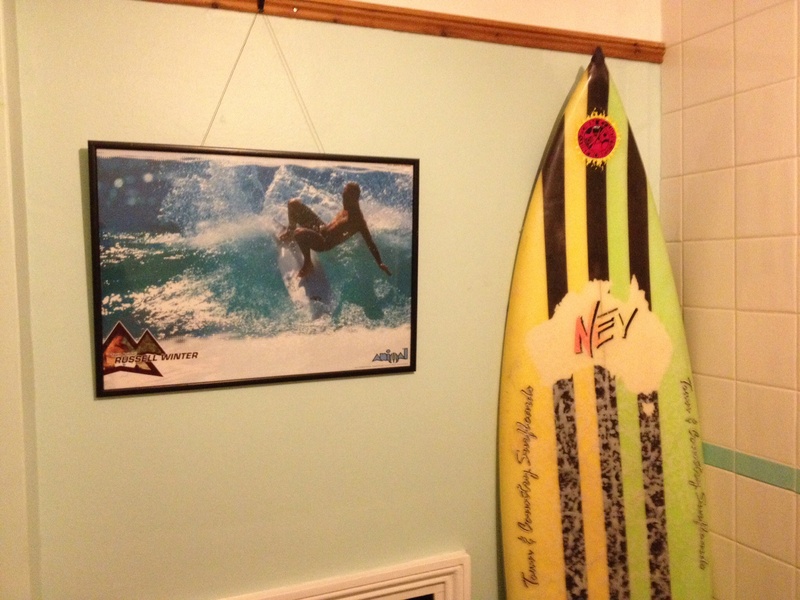 Lovely….. Glad to see that this is the one that took pride of place, I’m pretty sure he had as many surfboards as he did bikes at one point (aka almost as many as me! )… Funny thing is that I always thought that board was a bit ugly (it was the first board I ever owned) until Ben had it because he said he loved the look- and once he said that I kinda realise the retro beauty of the thing, I saw it through his eyes…. There’s a lot of things in my life that Ben made me see differntly, this old surfboard probably being the least profound (although he also put me off Animal clothing for life – despite working for them at the time… He wasn’t in sales was he?) But really, sal, it ain’t that beautiful! – it would be just as fitting a memory if it were strapped to the ceiling or somewhere out of the way!!! Glad that (in Saskia’s mind at least) he’s managed to perfect that off-the-lip snap… I guess ultimately we are what we’re remembered for… and who said those memories had to factually correct. Wherever he is now Im pretty sure he’s pulling into a load of barrels… Surf in Peace, Ben live-on-the Edge!